The kids are back on school holidays so no more sandwiches for them. Today I decided to make this pasta bake for them. They loved it. I loved it. This was very easy to make, using very simple ingredients. Originally the recipe uses speck not bacon, but I had bacon at home so I used it, if I had speck at home I would have used that, to me, speck and bacon are interchangeable. If using speck use 1 x 250g piece speck, rind removed, cut into lardons. 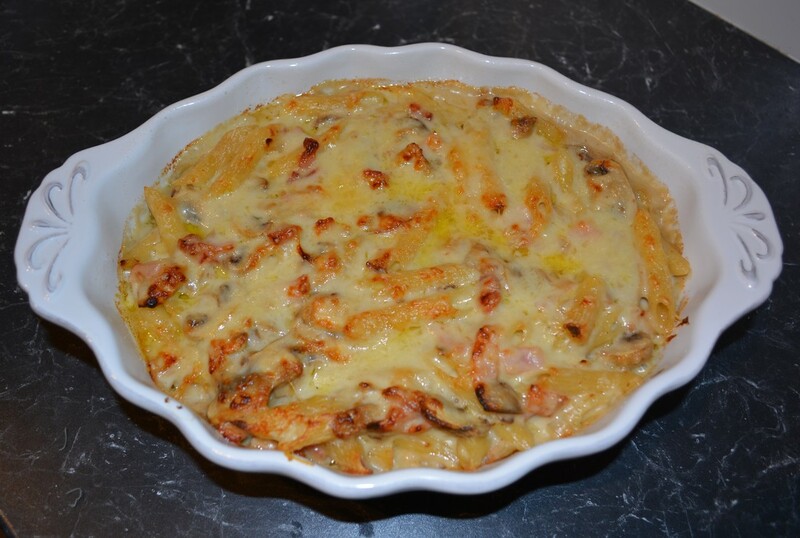 Even though I loved it and I will post the recipe as I made it, I would probably slightly decrease the amount of cheese next time, for it is quite rich, but this is a minor issue and if you love cheese, make it as it is, ignore me. Make sure you use a small onion as stated in the recipe as when you sauté it, it becomes sweeter and a large onion will make the dish too sweet. And if you don't like mushrooms don't make this, the flavour the mushrooms bring to this dish is simply amazing, every bite with mushrooms is just so nice. So here is a simple dish, that you can make your family and trust me, there will be no left overs. Cook the pasta in a saucepan of boiling salted water for 1-2 minutes less than directed on packet instructions, it needs to be just under cooked as it will continue to cook in the oven. Drain, set aside. While the pasta is cooking, heat the oil in a frying pan over medium-high heat. Fry the bacon for 5 minutes or until well browned. Using a slotted spoon transfer to a bowl, leaving the oil in the frying pan. Add the onion and mushrooms to the pan, fry for 5 minutes or until softened. Transfer to the bowl with the bacon. Preheat the oven to 220C. Grease a 1.5 litre capacity baking dish with the extra butter. Heat the milk in a small heavy based saucepan until hot but don't allow to boil. Melt the butter in a large heavy based saucepan, over medium heat. Add the flour, whisk for 1 minute. Reduce the heat to low, gradually add the milk, whisking after each addition, until the mixture is smooth and all the milk has been incorporated. Add 100g gruyere, whisk in until melted and smooth again. Season with salt and pepper. Add the pasta, bacon and mushroom mixture and parsley to the sauce. Stir, mix well. Transfer to your prepared dish. Sprinkle over the remaining gruyere. Bake for 15 minutes or until the top is golden. Serve with a green salad.